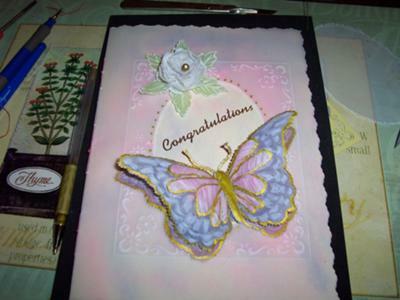 Parchment butterflies were the first thing I started to make when my granddaughter was born. The parchment is coloured by using chalk then securing it with cheap hair laquer, so that the chalk doesnt rub off. I really love butterflies. I have done other things and to prove it I will post more cards. Hope you like this card it took me hours to do but Im faster now. I love this idea of showing what I can do. Parchment always looks really lovely to me, always fine and delicate. It makes a card look so special. There are many patterns available to follow or you could trace them freehand but whichever method you choose the work is lovely. this is a really nice card. I like it lots. Thanks for sharing it.